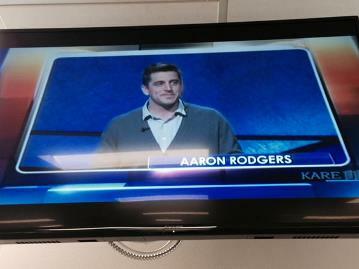 *Rodgers wore a sensible shirt/sweater combo. I’d make fun of that, but it’s pretty much what I wear 95 percent of the time in the fall, winter and spring. *His first correct answer was about NBA Hall of Famer John Stockton. *Host Alex Trebek did the “discount doublecheck” move from Rodgers’ commercial fame during the “get to know you” segment and nobody will ever be the same. *Rodgers trailed at the break, but his competition — astronaut Mark Kelly and Shark Tank’s Kevin O’Leary looked about as interested as NFL veterans playing in a fourth preseason game. Li’l A was able to vault into the lead thanks to a quick button release and impressive scanning of the board. Faltering on a $3,000 Daily Double clue could have been a huge mis-step, but he carried a commanding lead into Final Jeopardy. *All three contestants missed badly on the final clue, but Rodgers bet wisely and wound up taking the victory. For a football/Jeopardy analogy, it was akin torecovering an on-side kick and running out the clock in terms of boring finishes, but Rodgers will certainly take the W in this case and the $50K in money for charity that went with it. *Conspiracy theorists will note that Rodgers answered a “Princess Bride” question correctly and that it’s one of his favorite movies, but he *probably* would have won without the help. Her “instructional” videos have made her a Twitter star with millions of views after her first one in December was done as a joke to send to her five siblings.